Easter time is a great time to make many different fun cookies, cakes, and desserts. It is always a sign of spring and there are many fun and pretty colors that can be used when decorating. 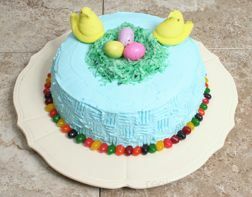 The Easter cake below is an example of a fun and colorful Easter treat that is easy to make. This is a fun cake to make and decorate with kids. 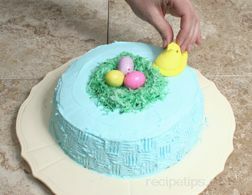 The recipe below is a quick and easy version of this Easter cake. 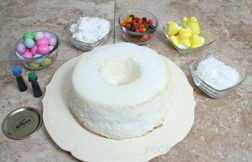 It calls for an angel food cake, which can be purchased at the bakery in the supermarket or quickly made from a mix. The cake can also be made from a layered cake mix or from scratch and it can be any flavor you desire. The frosting may simply be your favorite canned frosting or you can make your favorite homemade recipe. Decorations can also vary according to what is available. 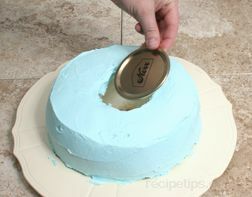 Place the cake on a cake plate or some other type of flat surface that is suitable to hold the cake. Have the other ingredient ready to use. Open the frosting and spoon it into a bowl. 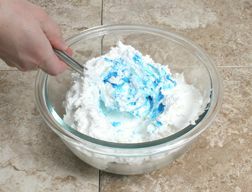 Add one or two drops of blue food coloring to the frosting and stir. Add more food coloring one drop at a time if needed to make the frosting the desired color, being careful to not add too much. 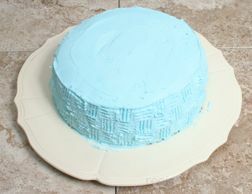 Frost the cake with a thin layer of frosting to hold the crumbs in place. 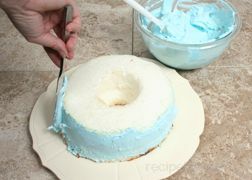 Allow this thin layer of frosting to set for 10 minutes before applying the second layer. 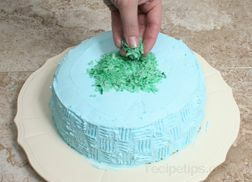 While the frosting is sitting, color the coconut with the green food coloring so that it looks like grass. 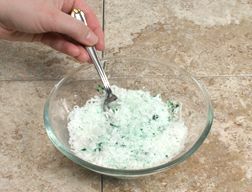 Place the coconut in a bowl and add a couple of drops of green food coloring. 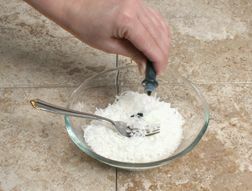 Mix the food coloring into the coconut with a fork until it is fairly evenly coated. 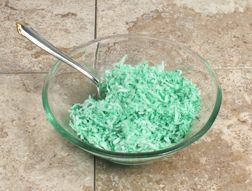 If the coconut is not dark enough, add more food coloring. Add one or two drops at a time and stir in evenly before determining if more is necessary. Set coconut aside until needed. After the cake has sat for 10 minutes, spread the 2nd layer of frosting on the cake. Try to make the frosting a smooth as possible. Place the canning lid over the hole of the angel food cake to cover the opening. Frost over the lid once it is in place. Note: If you do not have a canning lid you can cut a circle from a piece of cardboard and place that over the hole. 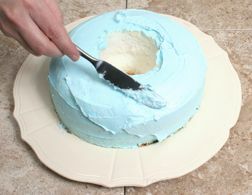 Make the baske tweave around the sides of the cake using a fork. 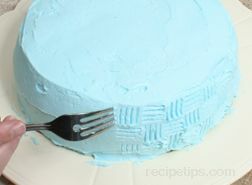 Beginning at the top edge, use the tines of the fork to first carve a set of vertical lines approximately 1 inch long in the frosting and then turn make a set of horizontal lines next to them. Then make another vertical set next to the horizontal lines. As you are moving around the cake, start a second row below the top row with the lines running in the opposite direction of the lines in the row above. Continue to add rows down the side of the cakes until you reach the bottom. Depending on the height of your cake, you may end up with 3 or 4 rows done the side. Continue making the basket weave around the remainder of the cake in the same manner until the sides of the cake are covered with the basket weave. After finishing the basket weave pattern on the frosting, add the green coconut to the top of the cake in the center so that it looks like a small nest. Place the colored candy eggs in the middle of the coconut to look like eggs in a nest. Next place two little chick or rabbit Peeps® on top of the cake. 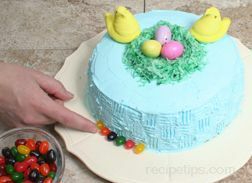 Finish the cake by place jelly beans all around the bottom edge of the cake, alternating colors as much as possible. Once the jelly beans are added, the cake is ready to serve. It is sure to attract a lot of attention at Easter from both kids and adults. 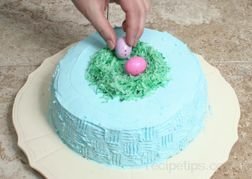 "This looks like a simple way to decorate a cake for Easter. I am going to make it for the kids this year. They love angel food cake and I know they will get a kick out of the decorations. It is simple enough that they can even help decorate it." "I made this Easter cake last year for the grandkids. It was easy and fun to make and they loved it. I am going to make it again this year and just change the decorations a little."